Here we are going to think about structuring sentences. A sentence is embodiment of what humans picture inside the head. However, only part of it can be delivered at one time. To deliver what you picture in your head precisely, you need to structure the sentence properly. Let’s take an example from the beginning of Momotaro (a famous old tale in Japan). 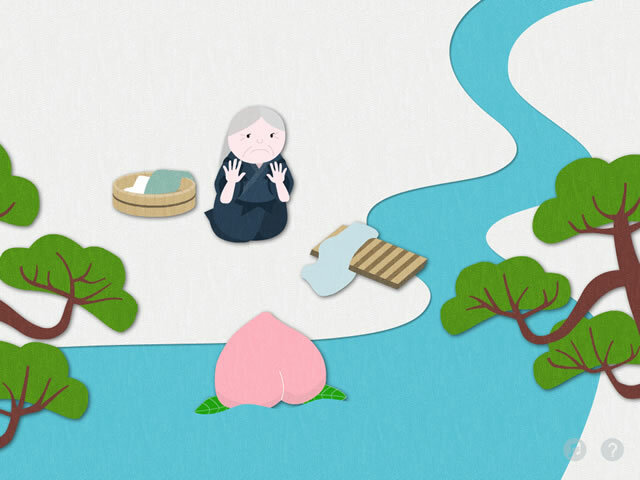 The image below shows the scene “when the old lady was washing the clothes in the river, a huge peach came floating down. She was surprised.”. This scene can be expressed in one image. However, to explain this in words, you’d have to explain in several parts: the scene has ”the river” and the character is ”the old lady”. The old lady is ”washing the clothes” and from the headstream came ”a huge peach” floating down. The reader firsts read the sentence, re-constructs the image presented by the author inside the head, and then understands what the author is trying to deliver. An image inside the head is, in the ROBOmind-Project, regarded as the virtual world. a sentence by putting them all in order. The rule that binds words by words is grammar. Yet, even with words and grammar, there will be still infinite sentences to be generated. So I’m going to explain how to structure a sentence in this passage. In order to convert the virtual world into sentence, you need an explanation of the scene. What are required in explanation is ”place””characters””items” and ”time”. In the beginning of Momotaro, the place is ”the river”. The character is ”the old lady” and the item is ”a peach”. Next, ”a peach” comes ”the river”. Newly arrived ”a peach”. To be precise, ”a huge peach”. This ”huge” describes “the size” of ”a peach”. “The size” is one category of ”a peach”. “Concrete items” have categories such as ”size” ”weight” and ”color”, this is one category ”size” describing. What can be said from this is that, after the step of describing characters and items, it moves on to the step of explaining its categories. From this point, ”characters” and ”items” in a scene is an explanation of static situation. Then, ”a huge peach” comes to ”the old lady who was washing the clothes”. A “happening” is an explanation of dynamic situation which describes what the ”characters” and ”items” did what ”action”. In the end, ”the old lady” is “surprised” to see ”a huge peach”. This is a occurrence of a cognitive（emotion：surprise）pattern. What the scene is trying to say is this ”cognitive pattern”. That the old lady was ”surprised”. So the above-mentioned rule stipulates how we should structure a sentence to deliver the content properly. The proper order is as follows: first to explain the static situation of the ”scene”. 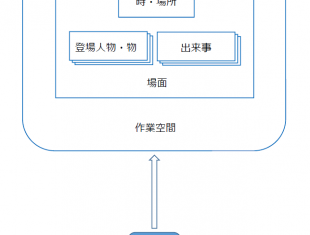 Then, move on to explain the dynamic situation ”happenings” and finally, to explain the consequence of the happenings, cognitive pattern”. This is the basic pattern of sentence structure. Even if what you are trying to say is ”the old lady was surprised”, you cannot bluntly say “the old lady was surprised”. The audience will be puzzled and go “what are you saying?”. To deliver what you are trying to say to the other, you need to have the same set of the scene on the virtual world inside your head, reconstructed inside the audience’s head. That’s why there is a rule for sentence structure so that sentences in the virtual world are easily converted. As the audience shares the same rule, they can reconstruct the virtual world from sentences, and understand what they are trying to say.